Brilliant Bridal is a rapidly expanding retail store with five locations across the country. 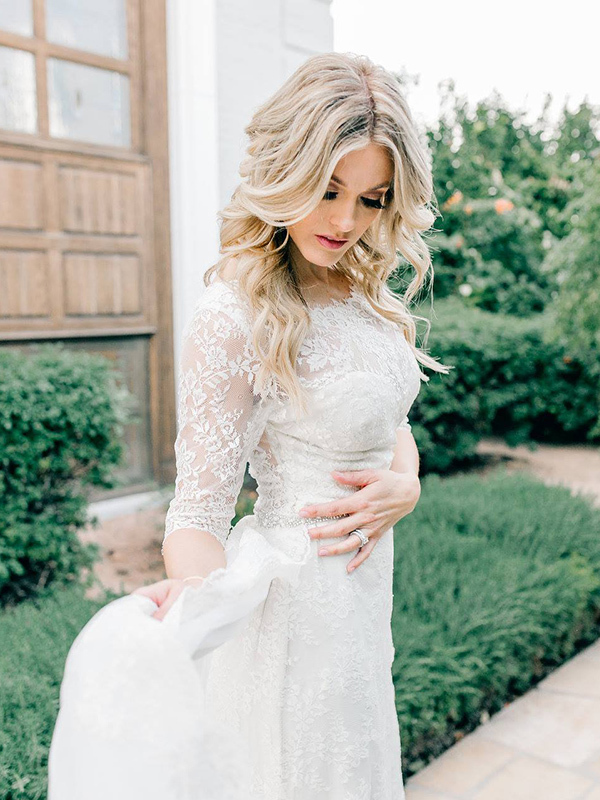 They help brides find their dream wedding dress for an unbelievable price. All of their designer dresses are available for 30-80% off retail and can be taken home the same day. 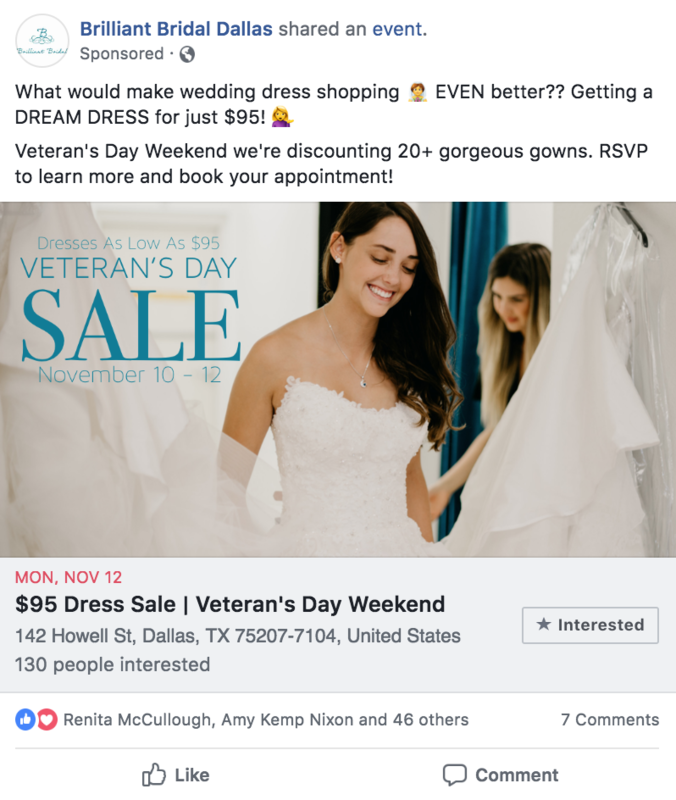 Brilliant Bridal approached Petrucci Marketing with the goal of implementing a Facebook and Instagram ads strategy that would give them more insight and tracking above their current efforts, and increase exposure to their rapidly expanding national brand in both new and existing markets. 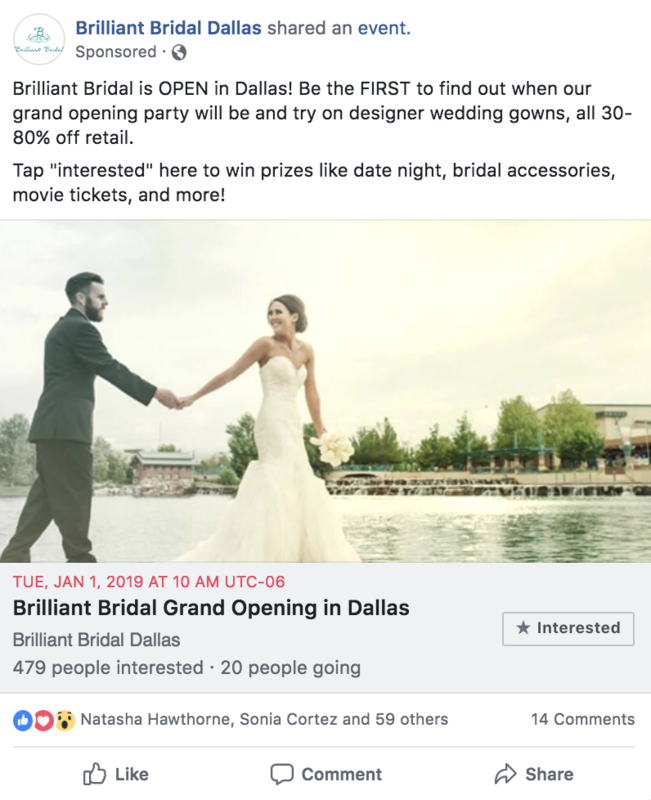 One specific item we were invited to contribute on was helping with buzz and appointments for their Dallas Grand Opening. Track people who booked appointments. Track people who started booking appointments, but didn’t finish. With this tracking in place, precise measurement and retargeting became possible. We also decided to leverage an out of the box idea for the grand opening, which used a Facebook event (more below). After implementing event response ads, cost per booked appointment overall decreased by 82%. Over the next several months, we were able to get the average cost per booked appointment down another 52%. Creating a 91% overall decrease in cost per appointment booked. 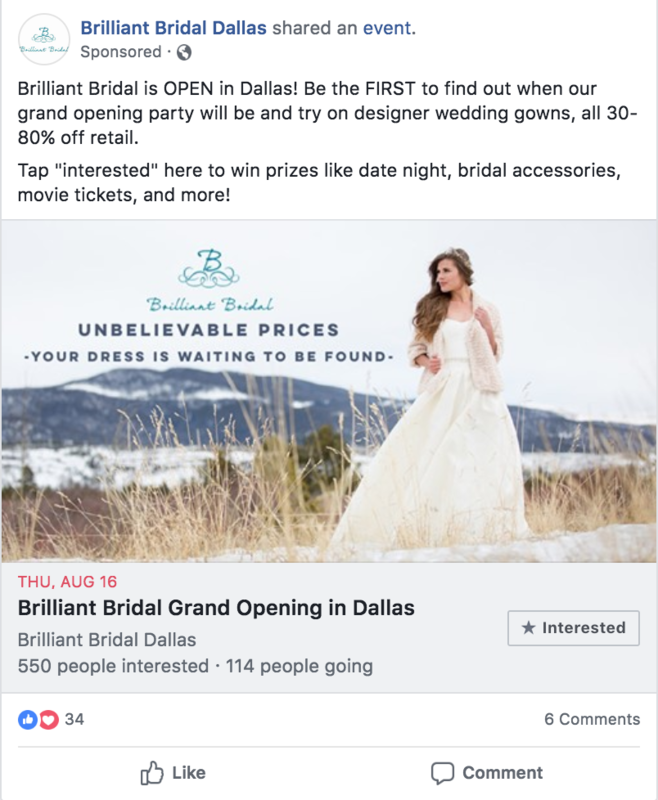 Shortly after partnering with Petrucci Marketing, Brilliant Bridal planned a grand opening for their newest location in Dallas. To drum up interest, our team created an Event Response ad. The social proof and retargeting capabilities made event response ads an objective we had to test. 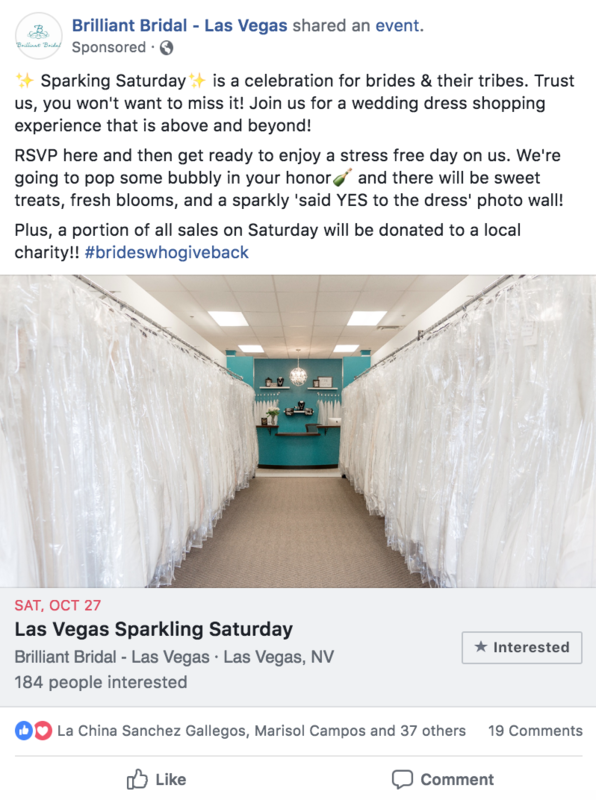 After running the event response ad for the grand opening, appointments booked increased and cost per booking decreased compared to website click campaigns. Initiate Checkout = Started booking appointment, but didn’t confirm. 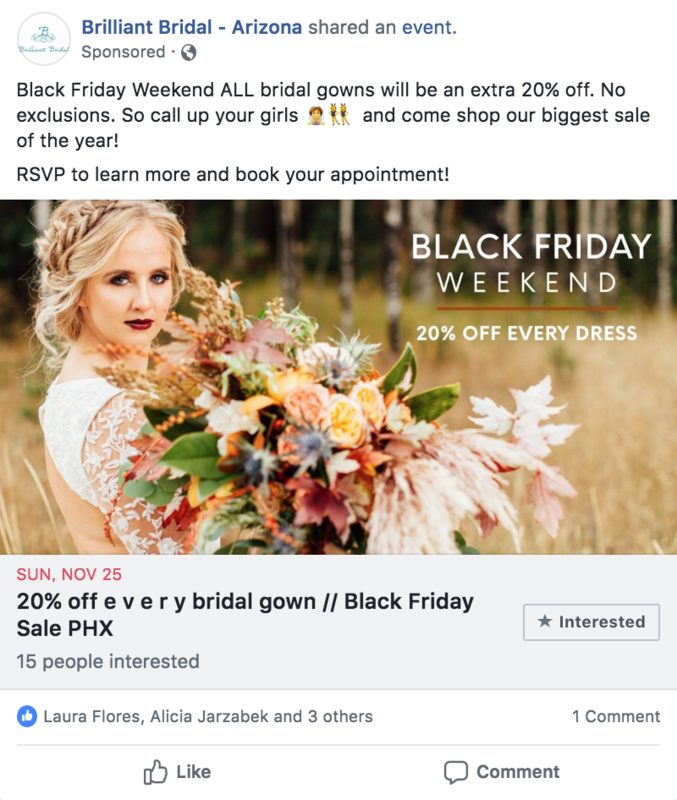 Using this as a proof of concept, we integrated Event Response campaigns for other events Brilliant Bridal hosts and major holiday sales.